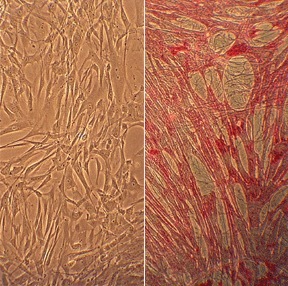 Human Umbilical Vein Smooth Muscle Cells (HUVSMC) from Cell Applications, Inc. have been used in studies evaluating treatments that involve blood vessel stents. (Click to Enlarge) Human Umbilical Vein Smooth Muscle Cells: HUVSMC. Cells isolated from the vessel that carries oxygenated blood from the placenta to the fetus. Gaston, B., A. Straub, B. Isakson, and L. Columbus. 2015. Compositions and Methods for Regulating Arterial Tone. Patent Application US 20150274779 A1. Thakali, K., J. Saben, J. Faske, F. Lindsey, H. Gomez-Acevedo, C. Lowery, T. Badger A. Andres and K. Shankar. 2014. Maternal pregravid obesity changes gene expression profiles toward greater inflammation and reduced insulin sensitivity in umbilical cord. Pediatric Res, 76:202-210.
van der Vorst, E.P.C., L.Z. Vanags, L.L. Dunn, H.C. Prosser, K.-A. Rye, and C.A. Bursill. 2013. High-density lipoproteins suppress chemokine expression and proliferation in human vascular smooth muscle cells. The FASEB Journal. 27:1413-1425. Wang, H., F. Zhang, Y. Meng, T. Zhang, P. Willis, T. Le, S. Soriano, E. Ray, K. Valji, G. Zhang, and X. Yang. 2013. MRI-Monitored Intra-Shunt Local Agent Delivery of Motexafin Gadolinium: Towards Improving Long-Term Patency of TIPS. PloS one. 8:e57419. Lee, Y.-L., C.-H. Chiao, and M.-T. Hsu. 2011. Transcription of Muscle Actin Genes by a Nuclear Form of Mitochondrial RNA Polymerase. PloS one. 6:e22583. Gelissen, I.C., S. Cartland, A.J. Brown, C. Sandoval, M. Kim, D.L. Dinnes, Y. Lee, V. Hsieh, K. Gaus, L. Kritharides, and W. Jessup. 2010. Expression and stability of two isoforms of ABCG1 in human vascular cells. Atherosclerosis. 208:75-82. Maier, K., X. Han, B. Sadowitz, K. Gentile, F. Middleton and V. Gahtan. 2010. Thrombospondin-1: A proatherosclerotic protein augmented by hyperglycemia. J Vasc Surg, 51:1238-1247. Du, W., K.M. Pryse, J.A. Fee, E.L. Elson, and R.J. Okamoto. 2007. Vascular Smooth Muscle Cell Mechanics During Cyclic Stretch: Effect of Serum and a Serum Substitute. In ASME 2007 Summer Bioengineering Conference. American Society of Mechanical Engineers. 267-268.